Dan Panorama Tel Aviv Hotel is a sophisticated luxury hotel that overlooks the Mediterranean Sea and is close to many of the city’s best attractions. It can be found on the southern side of Tel Aviv’s busy coastal promenade, within walking distance to Old Jaffa and UNESCO’s White City, Nachlat Binyamin pedestrian mall, and the bohemian neighborhood of Neve Tzedek. The hotel is recommended for families since it is situated in a quieter area of the promenade, away from the bars but is still central to attractions like the Carmel Market and HaTahana, a renovated railroad turned modern cultural and commercial center with stores, restaurants, markets, arts, and activities for children. The hotel also faces the Charles Clore Garden, a 29.6-acre beachfront public park (a great place for kids to run around), and one of the city’s more popular beaches, Banana beach. Dan Panorama has 483 rooms – deluxe rooms, executive rooms, executive suites and a presidential suite. 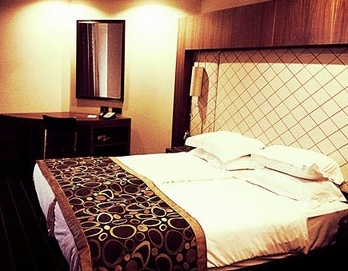 There are both smoking and non-smoking rooms, so be sure to specify your preference. Since most rooms can only accommodate two adults and a child, a traveling family of four with older kids should book two connecting rooms. If you have young child or autistic traveler whom you worry may wander onto the balcony, make sure to request a balcony door lock. 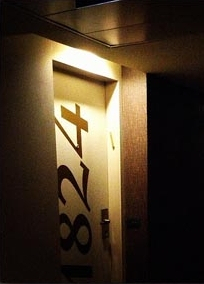 Before even entering your room, the first thing that will catch your eye is the room number in bold lettering up and down the door. This is both attractive to the eye and useful in helping you to remember your room number, especially when you are still battling jetlag and may be a bit groggy. The functional wooden decor theme is continued in the rooms where you will find dark hues of tans and olives are used. We were pleasantly surprised with the ample storage in closet and a chest of drawers – plenty of room if you are traveling with a family! We found the bathroom’s tub/shower combo with a wall-mounted showerhead as well as a handheld useful for parents with young kids, as well as the dual grab bars to prevent any slips. A very interesting feature was a non-opening window (with a Venetian blind shade) between the bathroom and room, providing natural light and the ability for parents to watch over a younger child while in the bathroom. Instead of a door hanger, the hotel has a “Do Not Disturb” button at the entrance. There were multiple electrical outlets throughout the room, which is especially important for families who need to recharge several electronics at the same time. The room safe was large enough to hold large electronics, like a laptop or iPad, and high enough for an average adult to reach. The Oneg nightly chocolates are the perfect blend of orange and chocolate, and were a welcome treat after a day of sightseeing! 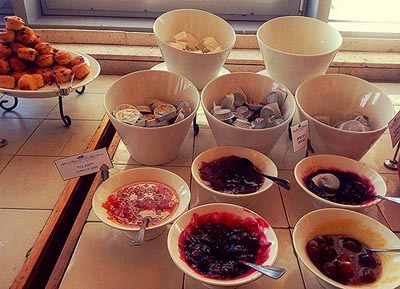 The Dan Panorama is very proud of its extraordinary breakfast spread, as they should be! The food is served buffet style and includes fresh salads, different fish, quiches, eggs, a wide selection of cheeses, waffles, yogurts, pancakes, and even freshly squeezed juice. Guests will find five different types of olives, delicious white Israeli cheese, and an addictive carrot jam that you will surely miss when you go back home! The atmosphere is casual and family oriented with large tables that can seat multiple family members or groups. The Dan Panorama features a newly renovated health club with a large swimming pool and a spa where guests can get a soothing massage, a rejuvenating facial, or relax in the sauna. The Danyland Kids’ Club was developed by the Dan hotels in the 90’s, a wonderful entertainment concept for kids of all ages. is reminiscent of cruise line’s kids club that caters to the different age groups. The two large rooms are bright and inviting with colorful murals on the walls. There is a toddler area with soft flooring, as well as imaginary play stations, and arts and craft tables. 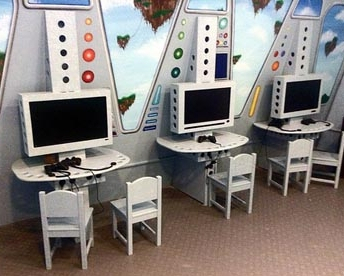 Older children can opt to use PlayStation video game systems or watch DVDs in the sitting area. There is no limit of attendance but they do request parental supervision for children under 3 years old – the Kids’ Club is not a babysitting service, but more of an entertainment center. Great review! Now everybody will like to stay at this hotel for few days!